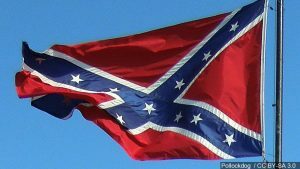 ORANGEBURG, S.C. (AP) — The lawyer for a South Carolina restaurant owner who wants to get rid of a Confederate flag in front of his business says it is a historical display in an area only zoned for businesses. The Sons of Confederate Veterans were given a small piece of land in front of Edisto River Creamery in Orangeburg by the building’s previous owner. Restaurant owner Tommy Daras no longer wants the Confederate flag out front, but the Confederate heritage group refuses to sell him the land or take it down. Orangeburg’s Zoning Board ruled against Daras last year, but he is appealing the ruling. The Sons of Confederate Veterans say that decision should be upheld. The Times and Democrat reports Judge Maite Murphy will make a decision at a later date.